The Society of Environmental Journalists joined around 350 other news media and journalism groups on Aug. 16 in urging President Donald Trump to abandon “enemies of the people” rhetoric that could incite violence and hinder the journalism that protects democracy. Here is the full SEJ statement, plus a sampling of media and journalism organization responses. In the end, more than 300 media outlets joined the #enemyofnone project led by the Boston Globe (may require subscription). It’s worth asking: What now? Trump has certainly not stopped attacking the media. Melody Kramer and Betsy O'Donovan wrote for Poynter some ideas on how media could follow up. Among them: Go beyond Twitter, preach to the unconverted, focus on service and win trust by showing your work. 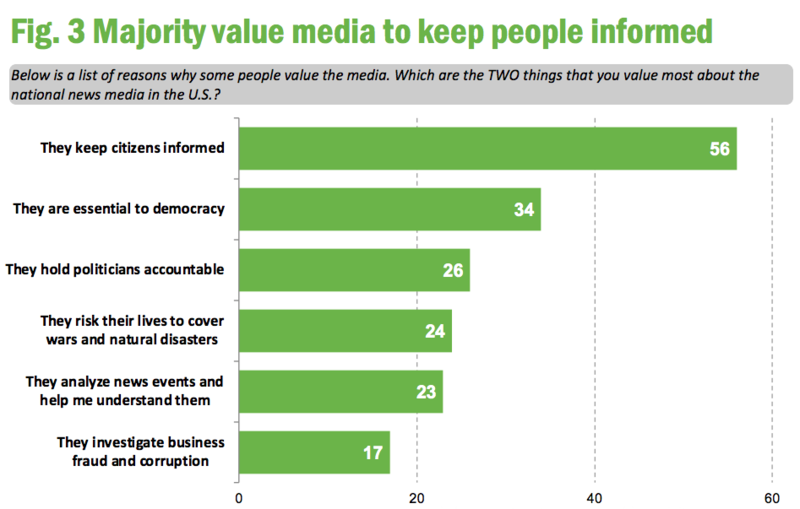 Most agree on the importance of a free press, but fewer saw news media as being under attack. IMAGE: Reporters Committee for Freedom of the Press. Click to enlarge. As the November 2018 midterm elections approach, a coalition of at least 22 professional journalism groups, led by Reporters Without Borders, launched a #DefendPressFreedom campaign encouraging voters to ask candidates how they plan to defend press freedom. SEJ has joined the nonpartisan call for action. SEJ takes such positions via its Freedom of Information Task Force. Also supporting the effort are the Society of Professional Journalists, American Society of News Editors, and Investigative Reporters and Editors. The full list. The groups hope to bring to light the critically important role that journalists play in the United States. In the face of mounting attacks on the media, it seeks to remind those running for office of the importance of an independent and free media. The Union of Concerned Scientists, a nonpartisan group advocating good science, has just published a report documenting extensive censorship of science across agencies during the Trump administration. The report, “Science Under Trump: Voices of Scientists across 16 Federal Agencies,” is downloadable. A new report from the Reporters Committee for Freedom of the Press finds that an overwhelming majority of voters — 95 percent — agree on the importance of a free press. 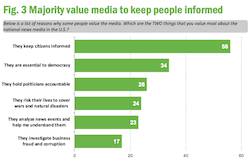 But as threats to the news media mount, a much smaller portion of the voting public is aware of the problem. Some 52 percent said they did not perceive the press as being under attack. For environmental journalists, drinking water safety stories are a reliable topic for getting audience interest. A nonpartisan, nonprofit group offers a database that makes finding such stories a lot easier. The Environmental Working Group’s Tap Water Database has been around for a while, but it has gotten better — it’s now easier to use and with more data. The U.S. Environmental Protection Agency and state regulators have their own databases (often the source of EWG data), but the Tap Water Database makes exploration user-friendly. Try tapping in your own ZIP code or the name of your state. * From the weekly news magazine SEJournal Online, Vol. 3, No. 33. Content from each new issue of SEJournal Online is available to the public via the SEJournal Online main page. Subscribe to the e-newsletter here. And see past issues of the SEJournal archived here.